(Newser) – An unnamed female teacher subdued a male student who fired shots and wounded another student in a central Illinois high school cafeteria on Wednesday morning, police said. Mattoon police Chief Jeff Branson and Mattoon School Superintendent Larry Lilly said the shooting happened at Mattoon High School about 11:30am Wednesday, the AP reports. The suspect, a male student, is in custody, police said, and the injured student is in stable condition at a local hospital. The names and ages of the suspect and the student who was shot weren't immediately released. Mattoon Community Unit School District 2 said on its Facebook page that it is working with emergency workers to determine what happened. The NRA is going to hate this since the teacher didn't whip out a pistol and kill the shooter a la Dirty Harry. Thank God she took care of this before the police entered the classroom. They would have inevitably shot the wrong people to death like they always do. They probably would have shot her dead. Whenever cops enter any situation lately they always pick out the first unarmed person and go straight for the head shot. 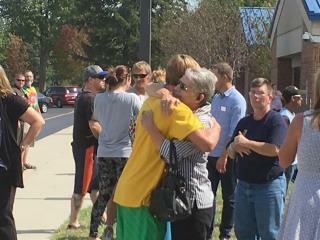 This is the fifth school shooting in Central Ohio in the last 4 weeks. These incidents are more common than basketball games at our schools today. Too bad this teacher wasn't at Georgia Tech the other night. She would have taken that Swiss Army knife off that dazed student in no time instead of filling him full of lead like the heroic cops did. A mass tragedy averted by hero teacher! The fact that the teacher is unnamed seems unbelievable, but with 57+ comments no one even seemed to notice. Sad. To call this article a blurb would be an overstatement. It appears a teacher will never get the credit deserved. not even half way thru the first quarter and two school shootings. I blame WalMart.